A FULL ten places in the world rugby rankings separate these two teams but you’d be hard pressed on yesterday’s evidence to know which side was second and which one was lying in a lowly 12th place. There is always the danger of reading too much into what is just a friendly but Scottish fans poring over the tea leaves will see plenty to put a smile on their face. A hesitant start saw the Scots on the back foot, but they took the lead early in the second half and headed their hosts after Peter Horne’s 60th-minute penalty before finishing strongly. It was Scotland’s sixth successive loss with some of the old weaknesses in evidence, notably defending the set scrum and rolling maul, but the fiercely competitive nature of what was a scratch side surely gave the players and their taciturn coach a timely boost, not that Vern Cotter was about to admit as much. “I think there were some good things and there were some things that we can work on,” said the Scotland boss. “The players’ intentions were good during this game but we let Ireland, who are a very good team, score a couple of tries a little too easily. Surely Cotter would have taken three tries at the Aviva before kick-off? Cotter likes his teams to attack with the ball in hand and his players not only bought in to this tactic, but they did it pretty effectively, too. If Richie Vernon still looks a little like a converted breakaway, which is what he is, his midfield partner, Horne, is starting to look a little like a young Gordon D’Arcy, which is what he could yet become. Horne scored one good try and proved a danger with the ball in hand, with clever footwork and brains making up for what he lacks in size and speed. If Cotter opts for an 18/13 split between the forwards and backs, then he may only have room for one utility back in which case Horne is in pole position, albeit after just one match. Should Alex Dunbar fail to recover in time, then Horne may go as a centre, leaving others, Greig Tonks and Ruaridh Jackson spring to mind, to fight for the roving role. On the injury front, Ryan Grant’s ankle is a cause for concern with no news as yet, Fraser Brown has a problem with his hamstring and Hugh Blake may have broken a finger for his efforts. Thankfully, skipper Henry Pyrgos came through unscathed after suffering the indignity of seeing his name misspelt (Prgros) in the match programme. 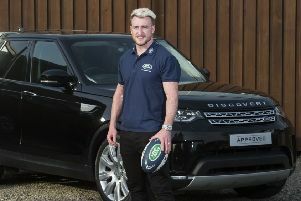 With just three scrumhalves in the squad – Chris Cusiter is currently training with Sale Sharks – all of them should make the World Cup cut and Pyrgos made the most of his opportunity with a solo try topping off an accomplished afternoon’s work. The Scotland captain was quizzed if he’d been surprised by the individual performances of several of his team-mates? With that in mind Scotland will travel to Turin in good heart.